The NanoLC 400 system is the latest generation in NanoLC from SCIEX and offers the widest flow rate range of any SCIEX NanoLC system to date, enabling a diverse collection of workflows on a single low flow LC/MS system. Interchangeable flow control modules enable users to switch effortlessly between nanoflow and microflow applications. Proteomics researchers no longer have to choose between the high sensitivity of Nano-LC/MS and the high throughput of micro-LC/MS. Now one system can be used to move from protein ID and discovery work to higher throughput targeted assays. With improvements to SCIEX's proven Microfluidic Flow Control, the NanoLC 400 and MFCPlus technology not only enables the simple interchange between different flow rate ranges, but also ensures reliable gradient delivery and reproducible retention times. 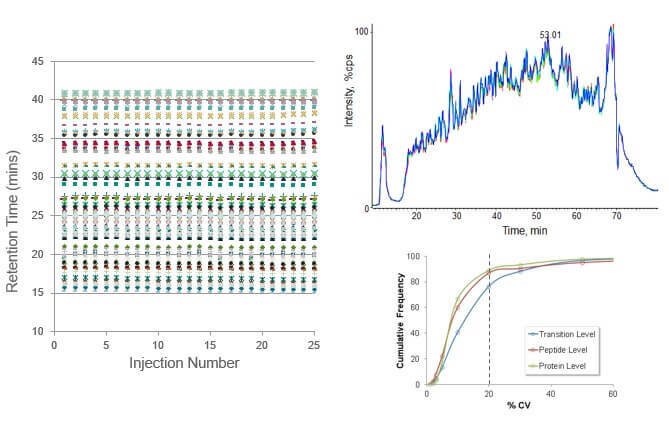 This is critical for getting the most out of data-independent strategies for quantitative proteomics like SWATH® Acquisition on an SCIEX mass spectrometer and any quantitative proteomics workflow. 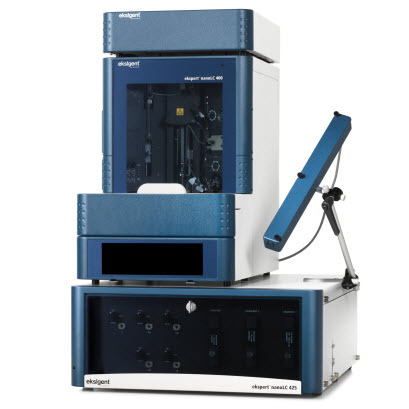 The NanoLC 400 system is available in single- and dual-gradient configurations in the same compact footprint; and integration with the cHiPLC system and popular mass spectrometry software packages* makes this system a universal front end to almost any nano-LC/MS system, enabling a broad range of workflows for busy multi-user and multi-instrument proteomics laboratories. *Direct control through SCIEX Analyst software, and Thermo Xcalibur. The NanoLC™ 400 product series enables the full range of protein expression workflows that drive the identification of novel biomarkers to advance precision medicine research. Ideal for the biomarker researchers digging deep in discovery or scaling up to validate their research findings, this front-end system is an innovative, flexible solution for a broad range of workflow needs. Plug-and-play flow cartridges give you the flexibility to easily switch from the ultimate sensitivity of nanoflow LC-MS for discovery to high-throughput microflow LC-MS for validation. The NanoLC 400 Series is available in two models, with patented pumps that make these systems among the most accurate nanoflow models on the market. Combined with industry-leading SCIEX mass spectrometers, the NanoLC Series provides high sensitivity, robustness and ease of use to support the latest in data-independent quantitative proteomics with SWATH® Acquisition. When your sample is limited, and sensitivity is needed choose the NanoLC 415 for direct-to-column or trap-and-elute workflows. The NanoLC 415 is a complete package, providing an autosampler, solvent organizer, sample storage and cooling; plus a column oven - giving you the confidence that you will be up and running quickly. 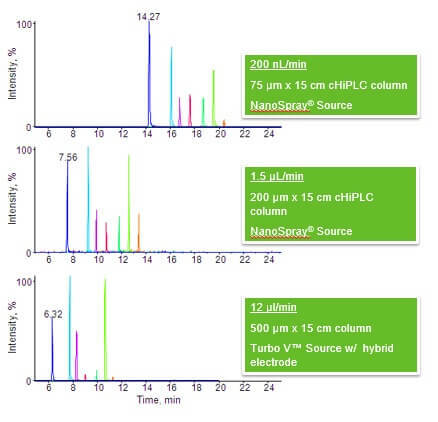 The NanoLC 425 is an ideal HPLC system for labs performing a broad range of proteomics analyses. The additional pump gives you the power to dive deeper into your sample – with the ability to see more using 2D workflows. With the flexibility to have pre-set nano and microflow configurations, this 2-in-1 system is ideal for labs with diverse applications that need to actively switch between flow regimes. Like the NanoLC 415, this integrated system includes an autosampler, solvent organizer, sample storage and cooling; plus a column oven – helping your lab to realize its full potential. With single-gradient and dual-gradient models available - workflows from simple trap and elute to complex multi-dimensional separation are possible. 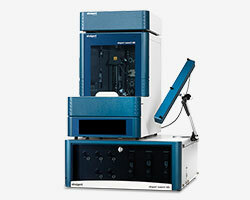 The NanoLC 400 Series readily fits the ever-changing needs of your proteomics lab. When you only have minimal amounts of sample, the NanoLC 400 Series can get you the high-quality identification and quantitation data you need for new biological insights. When you are ready to industrialize your workflow, the NanoLC 400 Series can readily move to microflow to give you more robustness and higher throughput. With the NanoLC 400 Series’ patented Microfluidic Flow Control™ technology, you get consistent, accurate results without flow splitting, even at the high pressures. Better quality data for your lab is just a click away. Consult with us to see how nanoflow can help you overcome your biggest challenges. Shorter run times and higher throughput can be achieved using microflow instead of nanoflow. Plug & play modules enable effortless switching, and a faster autosampler supports the move from biomarker discovery to verification assays. For quantitative proteomics, maintaining retention time reproducibility is crucial. The latest in SCIEX’s Microfluidic Flow Control technology, MFC Plus™, uses fast flow measurement in combination with automatic feedback to generate accurate and reproducible flow rates without flow splitting. The result is gradient reproducibility typically better than 0.35% at flow rates as low as 100 nl/min. To achieve the best possible retention time reproducibility, an optional column oven capable of temperatures up to 60°C is available for all nanoLC 400 systems. Elevated temperatures can also be employed to decrease column pressure and improve separation efficiency. For advanced applications like sample pre-concentration or dual-column set-up, the SCIEX nanoLC 400 autosampler accommodates one or two 10-port nano valves rated at 10,000 psi and have an extremely low port-to-port volume of < 25 nl. The system’s control software enables users to rapidly create experiments and modify methods. Its method editing wizards and built-in diagnostic tools provide ease-of-use to help maximize uptime.